This year Breguet once again joins Only Watch, the major international charity project sponsored by the Association Monégasque contre les Myopathies. This biannual event held in Monaco launched in 2005 benefits from the support of Breguet from its inception. The 2013 edition of Only Watch will take place under the high patronage of H.R.H. Prince Albert II. An exceptional auction sale of one-of-a-kind or first-in-a-series watches designed especially for the occasion will be staged for the benefit of medical research on muscular dystrophy. Sensitive to the gravity of these diseases and keen to demonstrate his commitment to aid ailing children, Mr. Marc A. Hayek, President & CEO of Montres Breguet, will once again make a contribution by offering a one-of-a-kind watch. Designed in the grand tradition of exclusive Breguet timepieces, the model Classique Chronograph openworked 5284 is animated by an exceptional Hand-wound movement, calibre 533.2 SQ, originally known as 2310. A noteworthy fact regarding this column wheel chronograph movement is that it has long been the motor of the finest watches of many a brand. Designed in the 1940s by Albert Piguet at the Lémania workshops, the calibre CH 27 undecorated movement quickly won a reputation for its endurance and reliability. It drew the attention of highly regarded brands, which preferred to use it for their chronographs rather than undertake the gigantic task of developing their own movement. Its popularity ensured its further evolution into the highly refined calibre 2310. 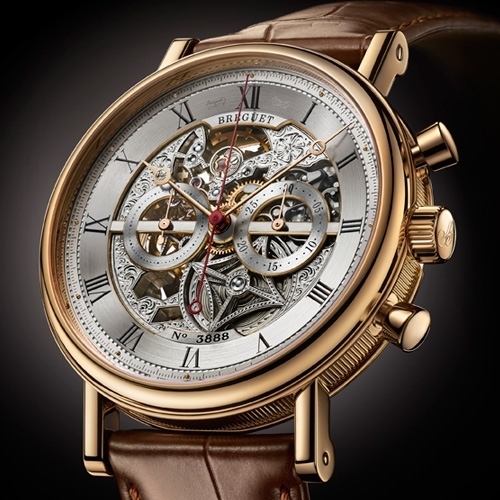 Today, Breguet brings this movement to life again by offering it a unique design. The case of reference 5284 in 18-carat yellow gold is decorated with fine fluting on the caseband, reflecting Breguet’s first timepieces. The open-tipped hands designed around 1783 by the brand’s founder enhance the overall beauty of the movement entirely engraved by hand, which can be admired through a sapphire crystal. Two counters symmetrically positioned at 9 o’clock and 3 o’clock are echoing each other in a subtle way, the first one indicating the small second, the other one being a 30 minutes counter. A large central hand completes the chronograph’s functions. This unique watch on a leather strap is water resistant to 30 meters and has a power reserve of 48 hours. Since it was acquired by Swatch Group in 1999, Breguet faithfully perpetuates the exceptional heritage bequeathed by its founder, as it continues to create ever more fascinating timepieces combining technical complications and pure, refined aesthetics. The Manufacture’s objective for excellence is notably reached through considerable investments in the latest control technology and in Research and Development. Breguet is proud to use its expertise in the service of a noble cause. The model Classique Chronograph openworked 5284 is manifestly an exceptional watch. Painstakingly finished and elaborately decorated by hand, its design’s unique character embodies a full measure of respect for high watchmaking centuries-old values. Case in 18-carat yellow gold with a finely fluted caseband. Sapphire-crystal caseback. 42.5mm diameter. Welded lugs with screw bars. Engraved “unique piece”. Water resistant to 3 bar (30m). Dial sapphire crystal. Individually numbered and signed BREGUET. Centered chapter ring. Small seconds at 9 o'clock and 30 minutes counter at 3 o'clock. Tachometer scale around the hours chapter. Breguet open-tipped hands. Hand-wound openworked chronograph movement. Numbered and signed BREGUET. Cal. 533.2 SQ, 12 lignes, 21 jewels. Power reserve of 48 hours. In-line Swiss lever escapement. Breguet balance spring. 2.5Hz frequency. Adjusted in five positions.